The Edgefield SPCA Treasure Chest will now be open Saturdays from 10 a.m. to 5 p.m. 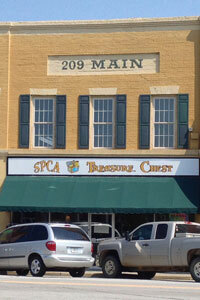 Hours will be Tuesday through Saturday, 10-5, just like all the other SPCA Treasure Chest stores. “Strong local encouragement and the support of the CEO Barbara Nelson allowed us to make this change,” reports manager Martha MacDonald. “Many, many thanks to the ladies,” was a gleeful note from Mrs. MacDonald. She will be the fulltime manager. Community members are encouraged to continue donating to the shop especially in this season of multiple yard sales and festivals. Anything not sold locally will be distributed to the Treasure Chest shops in Aiken and North Augusta. 2 Responses to "Treasure Chest to Stay in Edgefield"
WOW! that’s great! I’m so glad.